This is my latest cover art that I just finished for Regina Richards. The brief was based on a scene in the book which had a lot of complex elements. 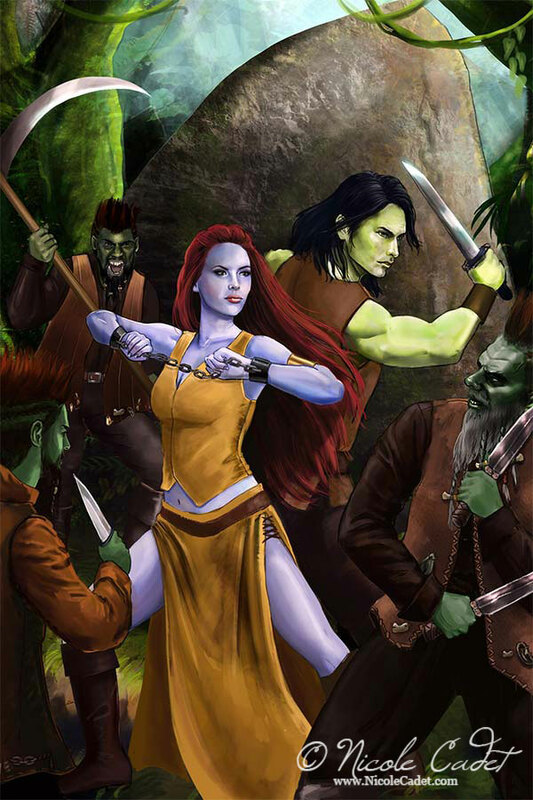 5 characters, each with detailed descriptions, green skinned characters in leather garb against a forest background, and one blue skinned character who is central to the novel. The original brief called for the female character to be on top of the rock, but the client and I agreed that it took the focus away from the two main characters and just didn’t work for the purpose of the commission. Sometimes this happens – what is a great action scene in a book, will translate fantastically well to an illustration, but may not work for a cover. When designing cover art, you have to remember that there has to be space for the author’s name, as well as the title of the book. As an illustrator, it’s my job sometimes to try and guide a client down a path that I think will work better. But all of my commissions are very much collaborations, with a very large amount of input from the client. Ultimately it’s the client’s product that I am creating work for, and it’s their name that will be associated with the work most visibly. That’s why commissions can take me 2-3 months from the first contact to the delivery of the final images. This piece had 5 sketches, one colour sample, and a couple of tweaks to the original sketch. And then there is the painting (I think I took 2-3 weeks for the final painting). In amongst this, I normally have a day job, although for this one I was at home, but not very well. I couldn’t spend huge amounts of time at the computer without feeling sick or dizzy. Anyway, here’s the finished product, and a few sketches as well!